If we were to describe contemporary office furniture with one term, that word would be “minimalism.” Minimalism became very popular in the 1950s, affecting designs in multiple disciplines ranging from art to architecture, to interior decorating. Inspired partly by the industrial revolution and the emergence of advanced machining and technology, contemporary design seeks to strip away superfluous ornamentation and focus on the practical essentials. Contemporary office furniture pieces follow this principle by emphasizing simple geometry based upon function—not decoration for the sake of decoration. The function itself guides the design, so a workstation or desking system often has a certain look that reveals its fundamental purpose in the office. One of the things we immediately notice about contemporary office furniture is that surfaces and desk edges are smooth. If you have ever looked closely at a traditional office desk, hutch, or bookshelf, you may have noticed that the piece featured routed edges that added an extra dimension of space. Contemporary office furniture pieces aim to create the exact opposite effect. Rather than magnifying the impact of the desk, table, or workstations, designers seek to decrease the visual impact with a more compact, self-contained aesthetic. It is for this reason that we see so many desks and workstations manufactured in standard sizes. Space planners can quickly develop a layout for an office, then select the pieces that will fill the space in predictable dimensions and fluid relationships to own another. This geometric simplicity makes contemporary office furniture a designer’s dream. Contemporary design is more about establishing spatial relationships than it is about filling the entire room with furniture. you ever heard the phrase “less is more?” This phrase refers to an aesthetic principle of using very basic, and often smaller objects to generate emotional impact. In a contemporary office space plan, tables, desks, and workstations are used to anchor focal points and establish geometric relationships between various parts of the office. Instead of using complex decorations to achieve their effect, these tables, chairs, and workstations rely upon clean lines and right angles to convey their effect. Office chairs particularly reveal this newer approach to design. They are built for comfort and support more than the appearance of opulence. Nevertheless, there is a certain elegance to their simplicity which makes them ideal for any conference room, executive office, or operations workstation. They also tend to be more ergonomic than many traditional styles because they are engineered first and foremost for maximum support. 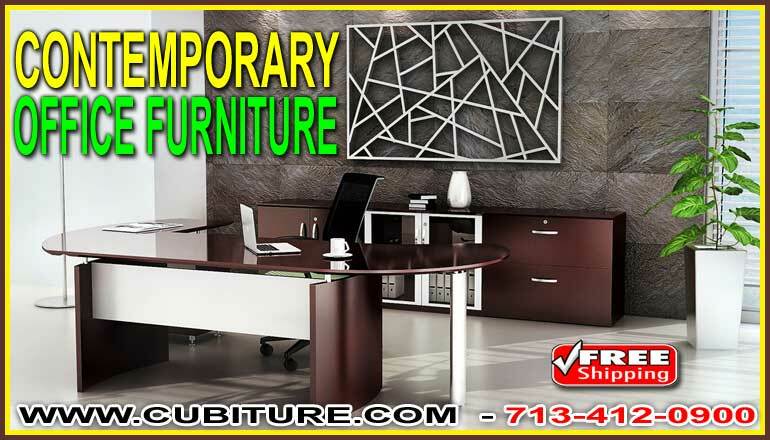 Cubiture acts as both a distributor and a manufacturer of contemporary office furniture. On the distributor side of our business, we represent over 500 manufacturers worldwide. On the factory side of the business, we build our own tables, desks, workstations, and filing systems here in our Houston factory. We offer complimentary space planning with every furniture quote, and we provide turnkey delivery and installation. Call now to schedule a walk-through or to send us a copy of your space plan.